Periodontitis, a chronic inflammatory disorder is one of the most prevalent human microbial diseases. A number of observation from epidemiologic and clinical studies suggest the role of psychological stress is the etiology and progression of periodontal disease. Recently, stress has been classified as a risk indicator for periodontal disease. Chronic stress and depression can result in general dysregulation of the immune system, both cellular and humoral pathways could be involved and could contribute to pathogenic and concomitant periodontal tissue destruction. Activation of the hypothalamic pituitary adrenal axis and inappropriate activation of sympathetic nervous system could contribute to the development of stress. Chronic biograde inflammation is associated with advanced capacities of neurotransmitter biosynthesis, that activate phagocytes which produce large quantities of reactive oxygen species (ROS) through nicotinamide adenine dinucleotide phosphate (NADPH) oxidase complex. This study is done to analyze the correlation between serum and salivary cortisol level with serum and salivary reactive oxygen metabolites (ROM) level and its objective is to check whether stress increases the severity of disease in generalized chronic periodontitis patients with positive scores for stress. This is done to check the association and correlation between serum and salivary markers. The study population comprised thirty subjects belonging to both sexes and aged between 30 and 45 years. Participants were divided into two groups 15 participants each. For Group I, participants were chosen following the criteria for chronic periodontitis. They are known chronic periodontitis patients who were clinically and radiographically evaluated. Clinically, the participants have visible plaque, bleeding on probing, clinical attachment level (CAL) ≥5 mm with 30% sites involving minimum of 8 teeth exhibiting pocket probing depth ≥4 mm and radiographically, they showed generalized bone loss. Participants for Group II were chosen according to the Hamilton Rating Scale (WHO criteria 2008). To rate the severity of depression in patients who are already diagnosed as depressed, administer this questionnaire. The higher the score, the more severe the depression (score 0–7 = normal, 8–13 = mild depression, 14–18 = moderate depression, 19–22 = severe depression, and ≥23 = very severe depression). Group II participants were known chronic periodontitis patients with moderate value of 16–22 under the Hamilton Rating Scale. Participants who had other systemic disease, on antibiotics (or) antioxidants and smokers were excluded from the study. The participants were briefed about the study and informed consent was obtained. Ethical committee clearance was obtained from the university. Two milliliters of blood was collected from the antecubital fossa by venipuncture using a 20-gauge needle with a 2-ml syringe and immediately transferred to a laboratory. The blood sample was allowed to clot at room temperature and after 1 h, the serum was separated from blood by centrifuging at 3000 × g for 5 min. 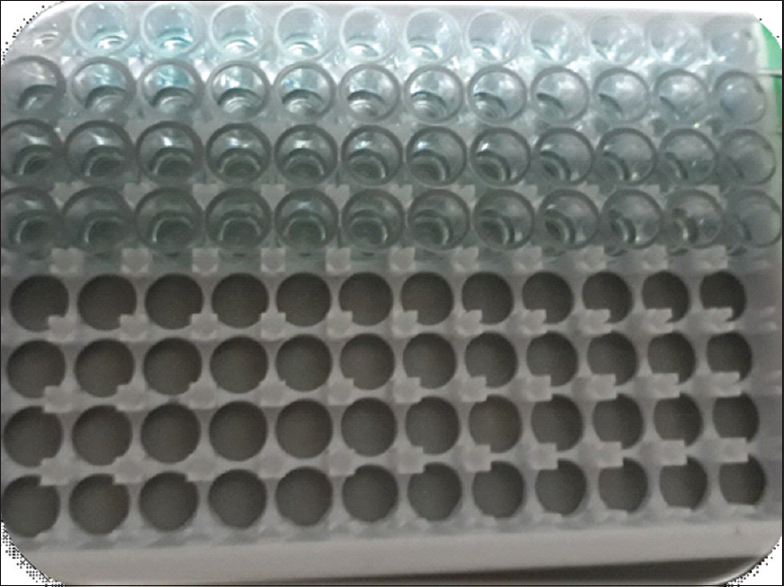 The extracted serum was immediately transferred to a plastic vial and stored at −70°C until the time of assay. The participant was asked to accumulate saliva in the floor of mouth and then spit into a preweighted or graduated test tube. 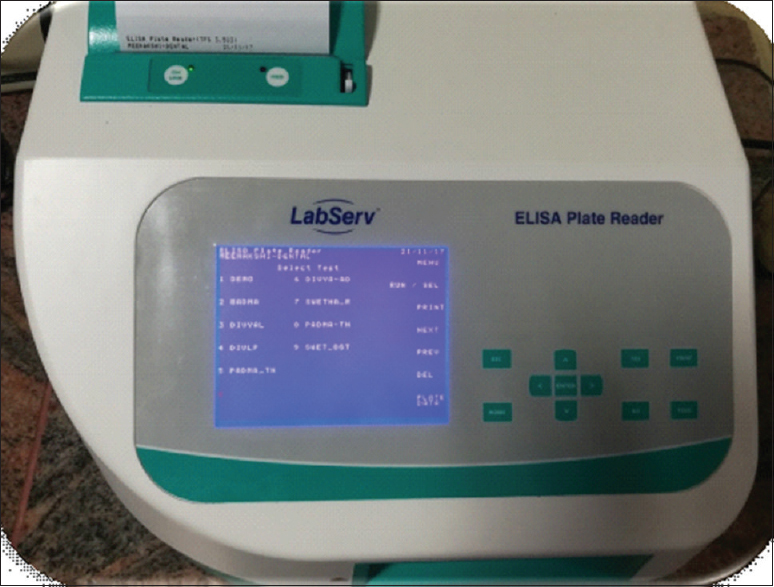 The measurement of serum ROM level (whole oxidant capacity of serum against N-N-diethyl paraphenylenediamine in the acidic buffer) was performed using a spectrophotometer by Mauro Carratelli method [Figure 1]. 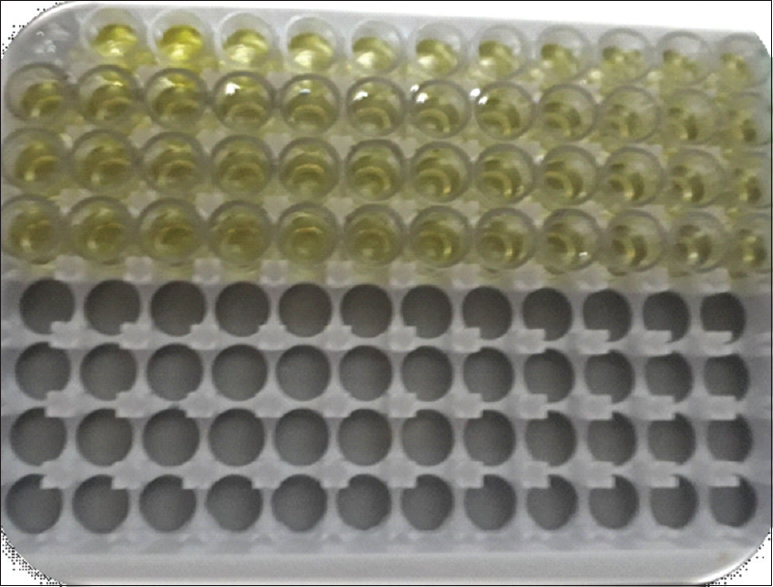 About 20 μl serum sample and 1 mL acetate buffer (pH – 4.8) were gently mixed in a cuvette and 20 μl chromogenic substrate (N-N-diethyl paraphenylenediamine) was added. 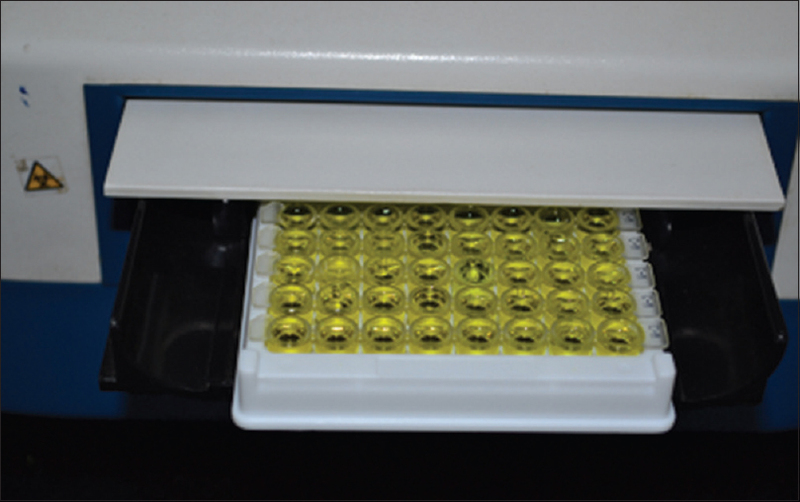 After mixing, the cuvette was immediately incubated in the thermostatic block of the analyzer for 5 min at 37°C. The 505 nm absorbance was recorded. The Carratelli unit (CARRU) is used for the measurement. It was established that 1 CARRU corresponds to 0.08 mg/dl hydrogen peroxide. 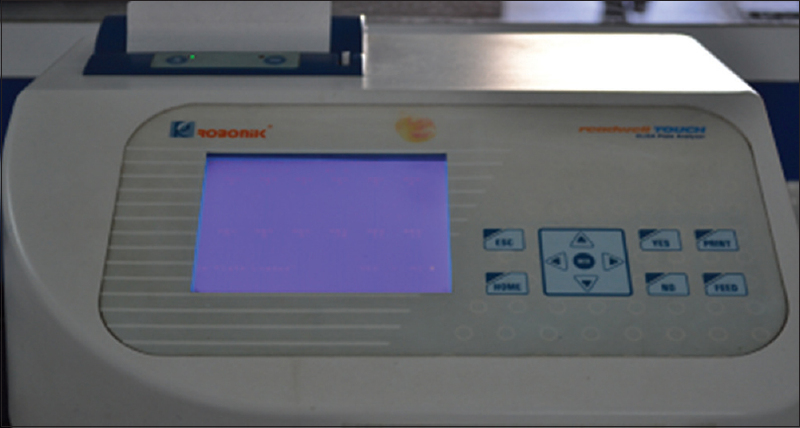 Measurement of cortisol by the DRG cortisol kit (solid phase enzyme-linked immunosorbent assay) is as shown in [Figure 2], for the quantitative determination of cortisol. It is based on the principle of competitive binding. The microtiter wells are coated with a monoclonal antibody directed toward an antigenic site on the cortisol molecule. Endogenous cortisol of a patient sample competes with a cortisol-horseradish peroxidase conjugate for binding to the coated antibody. After incubation, the unbound conjugate is washed off. The amount of bound peroxidase conjugate is inversely proportional to the concentration of cortisol in the sample. After addition of the substrate solution, the intensity of color developed is inversely proportional to the concentration of cortisol in the patient sample as shown in [Figure 3], [Figure 4], [Figure 5]. SPSS (IBM Corporation, Chicago IL, USA) software program version 16 was used to perform statistical analysis. Sample size of 15 participants per group was selected to get 80% power of the study. Pearson correlation was used for analyzing the correlation between cortisol and ROM among chronic periodontitis and stress with chronic periodontitis. Comparisons between the groups were done using paired t-test. On comparison between saliva and serum ROM and cortisol levels, it was not statistically significant. However, between the groups when the values were correlated, it showed a significant value in chronic periodontitis (Group I) and stress-induced chronic periodontitis (Group II). The relationship between serum cortisol and ROM within chronic periodontitis group is shown in [Table 1] showed a significant value (P=0.000) for correlation (Pearson correlation value is 0.738). The relationship between serum cortisol and ROM within stress-induced chronic periodontitis group is shown in [Table 2] showed a significant value for correlation (P = 0.000). When the value of ROM in serum and saliva were compared, ROM in serum was high. It showed a significant value (P < 0.001), which is depicted in [Table 3]. When the value of cortisol in serum and saliva were compared, cortisol in serum was high. It showed a significant value (P < 0.001), which is depicted in [Table 4]. Clinical parameters (probing pocket depth, CAL) were compared between Group I and Group II (P < 0.001). Group II showed an increased severity, which is depicted in [Table 5] and [Table 6] respectively. Oral health is an integral component of general health and well-being of an individual knowledge about the association between various systemic health and periodontal disease is growing rapidly. Psychosocial stress is thought to play a key role in the etiology and progression of periodontal infection. The factor responsible for such an association could be due to psychologically-induced modulation of the immune system, leading to increased levels of adrenocorticotropic hormone (ACTH) and alteration of crevicular cytokine levels depressed polymorphonuclear neutrophils (PMN)'s chemotaxis and phagocytosis, reduced proliferation of lymphocytes, changes in blood circulation, and healing time. The general mechanism has been grouped into two broad categories that could be health damaging association with stress such as poor oral hygiene, nutritional intake, and second could be due to pathophysiological factors that increase stress hormones., Increased cortisol indirectly influences the immunological and inflammatory profile and increase the susceptibility of an individual to disease. There is a redistribution of immune cells throughout the body often synergizing with the action of corticoids. Evidence suggested that levels of epinephrine and cortisol directly influence growth patterns of perio dontal pathogens that release ROS. Studies have suggested a continuous expression of Pro-OpioMelanoCortin (POMC) cells that increase leucocyte, cytokines, and ROM in tissues. It was hypothesized that the nonphagocyte NADPH oxidase system could be an important source of ROS superoxide ion during stress. The mean value of serum and salivary ROM in both the study groups were evaluated. The values (0.852) in group II is highly significant than Group I (0.738). The alteration in immune reaction initiate inflammatory changes in periodontal tissue, which could lead to the activation of activator protein-1 and nuclear factor γB pathways which are responsible for the production of inflammatory cytokines. When compared to the serum and salivary ROM levels, there was a significant difference (P < 0.001). Levels of ROM in serum are higher than in saliva. Free radicals play an important role both in physiological and pathological mechanisms. The increase in serum ROM level in the present study could be due to these systemic influences which could have resulted in the elevation of serum ROM level. Suppression of hypothalamus–pituitary axis leads to the continuous expression of POMC which could increase leukocyte cytokines and ROS. This could be the probable reason for increased levels of ROM in Group II patients. In the present study, serum and salivary cortisol levels are correlated with serum and salivary ROM levels in Group I and Group II patients. There was a positive correlation which was statistically significant. This could be attributed to the fact that stimulation of ACTH-medicated neuroendocrine interaction suppresses the immune system, thereby allowing a continuous expression of POMC cells. Changes in the antibody-mediated immunity by the corticoids could enhance the growth of a pathogenic microorganism, which could increase the level of ROS. This is the first study, where serum and salivary levels of ROM and cortisol were correlated. The study was conducted only on a small population, to generalize the results for larger groups; the study should have involved more numbers of participants at different levels. This could be one of the limitations of the study. The study attempted to find an evidence of the relationship between serum and salivary cortisol with serum and salivary ROM level and periodontal disease and level of ROM and cortisol. The results showed a positive correlation which was statistically significant. The use of psychosocial intervention as an adjunct measure in the treatment of periodontal disease might deserve further evaluation. High-quality studies are needed that would demonstrate the effect of stress as a potential risk factor. Smith SM, Vale WW. The role of the hypothalamic-pituitary-adrenal axis in neuroendocrine responses to stress. Dialogues Clin Neurosci 2006;8:383-95. Gouin JP, Kiecolt-Glaser JK. The impact of psychological stress on wound healing: Methods and mechanisms. Immunol Allergy Clin North Am 2011;31:81-93. Mannem S, Chava VK. The effect of stress on periodontitis. J Indian Soc Periodontol 2003;163:365-9. Diab-Ladki R, Pellat B, Chahine R. Decrease in the total antioxidant activity of saliva in patients with periodontal diseases. Clin Oral Investig 2003;7:103-7. Atanackovic D, Schulze J, Kröger H, Brunner-Weinzierl MC, Deter HC. Acute psychological stress induces a prolonged suppression of the production of reactive oxygen species by phagocytes. J Neuroimmunol 2003;142:159-65. Akcali A, Huck O, Tenenbaum H, Davideau JL, Buduneli N. Periodontal diseases and stress: A brief review. J Oral Rehabil 2013;40:60-8. Stabholz A, Soskolne WA, Shapira L. Genetic and environmental risk factors for chronic periodontitis and aggressive periodontitis. Periodontol 2000 2010;53:138-53. Aloe L, Alleva E, Fiore M. Stress and nerve growth factor: Findings in animal models and humans. Pharmacol Biochem Behav 2002;73:159-66. House SL. Psychological distress and its impact on wound healing: An integrative review. J Wound Ostomy Continence Nurs 2015;42:38-41. Cekici A, Kantarci A, Hasturk H, Van Dyke TE. Inflammatory and immune pathways in the pathogenesis of periodontal disease. Periodontol 2000 2014;64:57-80. Amic CM, Goldenberg RL, Moawad AH. Periodontal pathogens with persistent inflammation increase cortisol. J Psychatric 2015;7:137-42. Ansai T, Soh I, Ishisaka A, Yoshida A, Awano A, Hamasaki T, et al. Determination of cortisol and dehydroepiandrosterone levels in serum cortisol in chronic periodontitis in older Japanese Adults. Int J Dent 2009;37:1-8. Haleem DJ, Bozovic D. Academic and psychological stress. Eur J Psychatry 2015;14:85-97. Halawany HS, Abraham NB, Jacob V. Is psychological stress a possible risk factor for periodontal disease. J Psychiatry 2015;18:217. Dumitrescu AL. Depression and inflammatory periodontal disease considerations-an interdisciplinary approach. Front Psychol 2016;7:347.